Can someone help me with folds 54-55. I'm not really sure how to do the "open sink" folds right? i assume the steps you are referring to are from the special edition... steps 54-55 in the diagrams from world of super complex origami is just mountain folds and precreasing. Is there any place where i could get the folding diagrams for this origami? (perhaps in english better) Because i have one which is in Japanese and got stuck in step 55-56. Or maybe a well explained video. Tnks!! Is this thread still alive? Im quite new to this but i really need help with the open sink part at step 58 to 61. I presume that you are referring to the diagrams given as a JOAS special, not the ones from "World of Super Complex Origami". The sinks illustrated are "pleat sinks" - just do sinks in on the illustrated mountain folds, and sinks out on the illustrated valleys. Sink the innermost sink in first, sink out on the next line, in on the next and so forth until they are all done. I need help with step 113 (143 in WoSCO). I can't seem to execute the crimp properly. I tried to make it look like the diagrams, but it doesn't seem to work. Here is how it looks currently, after step 113. There is this excess visible paper near the neck/shoulder which I am unable to hide. Also, the large flap of the arm interferes with the violin. Finally the violin seems too low. It should be higher up, but step 114 shows that the crimp in 113 affects only the arm, and not the violin. that's about right for step 143. just position the arm holding the bow a little higher or to taste. 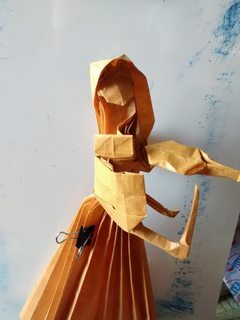 the skirt requires the origami technique of ga-lu in order to lock. bethnor wrote: that's about right for step 143. just position the arm holding the bow a little higher or to taste. Thanks. I tried to shape it using the various images of it found on flickr. The only issue I am left with is that the arm flap is too close to the violin, something that I noticed in a lot of models on flickr as well. So I think it's not that big of a deal. I did end up using glue for the skirt. The model is intended as a display piece, so I used a bit of glue to provide stability, and ensure that the paper wouldn't open over time. it helps to shape this model if you use some kind of foil-based paper. that said, i am 100% certain it is not possible to get it looking like hoyjo gets it to look without glue and wire or extensive wet-shaping.